I was very excited when I saw that this book was being written. 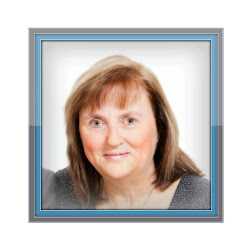 Anne Marie blogs at Future Flying Saucers and I had dropped in to her blog on and off during the last few years so I was somewhat familiar with her work. I'm often happy to see new materials for Children's Work but also I'm often disappointed because they are very costly and because they are just so apparently appealing to look at but when you get down to reading and reading and reading everything that is written for each lesson they are not as appealing at all. 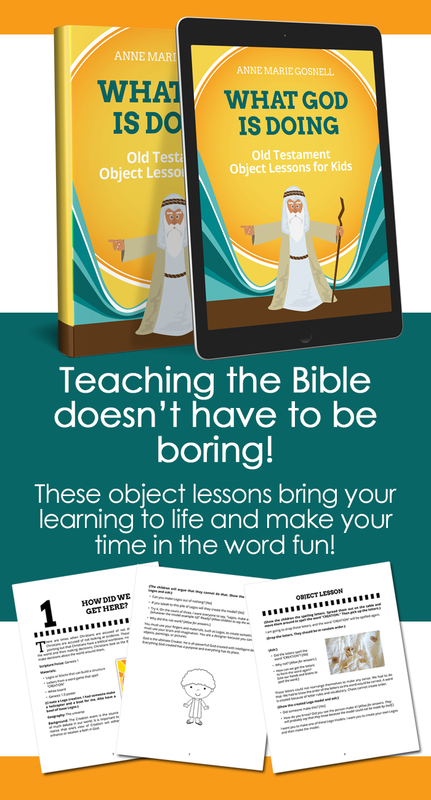 As a Kids Church leader for more than 40 years I have always been on the lookout for new materials that are kid friendly and teacher friendly as it does make a difference if both sides involved are really hooked by the products for the best reasons. 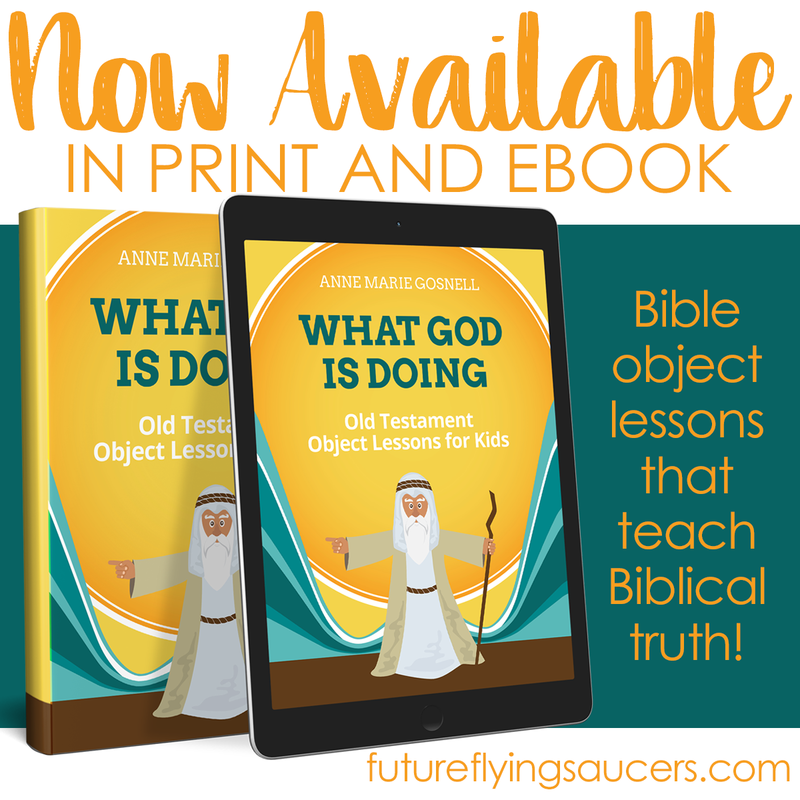 For me as a teacher, mother and grandmother those reasons have always been good solid Bible teaching in a way that is easy for me to work with and to encourage others to work with. 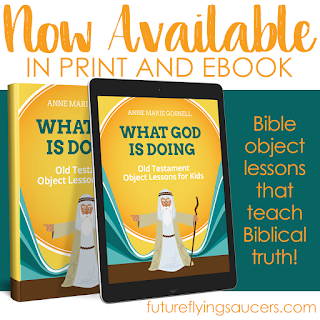 I need to know that it is not difficult to get materials to follow someone's lesson plan or to remember just how to make these materials fit in with the Bible Truth I'm teaching. For the children the products we use need to be entertaining without distracting from the lesson and relevant so that it is the Bible message they go out remembering rather than just the visuals or fun time they have had. Teachers for Sunday School and Kid's Church etc. are usually people who want to teach the Bible Truths but do not have days and days to read and prepare for each lesson they teach. We need good, brief, to the point, easy to follow lessons that we know we will actually feel competent about doing with our children. We do not want to find that the materials we are expected to use will involve us spending hours in shops trying to find. This book is definitely in the former category and not the latter. Here we have a product that is easy to follow, not complicated to put into practice and will certainly entertain but throughout it the Word of God is obviously at the centre and there will be no doubt that the children are pointed towards what God is doing in the Old Testament and therefore also to what Jesus has done for us all. I can envisage this book being used to form the main part of a Children's Church lesson, or a Sunday School lesson or as the Bible Truth for Messy Church or a Kid's Craft Day. I can also envisage using this book with my grandchildren in the years to come. I received a free copy of this ebook, however this review has been written not because I was obliged to do so but because I know I will use this book with my grandchildren as well as with children from church. Also if buying on Amazon I get a little commission but that does not mean any extra expense to you. The lessons I learned from my Sunday School teachers in my early years are some of my favorite lessons!! Great to see good resources out there! This looks like an amazing teaching tool for our kids. Thank you for sharing it!